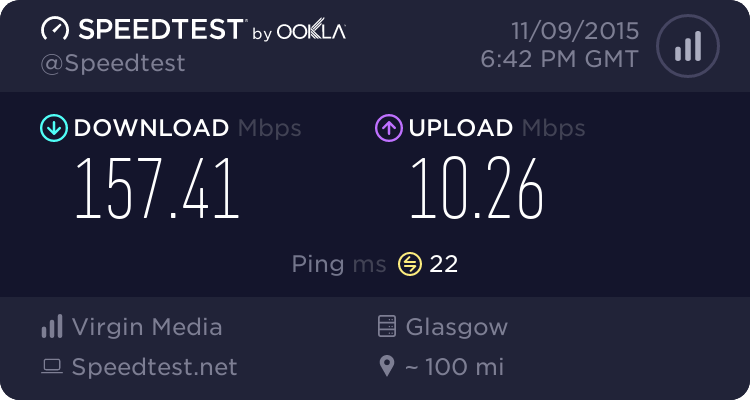 Now for the past couple of days everything has been rock solid 100mbit all day pretty much so now onto my dilemma as I am currently waiting to move to pulse8broadband as of the 04/01/16. I am currently in a 12 month contract but they are letting me penalty fee due to a £4 increase each month on what I am paying now and my contract ceases with VirginMedia on the 8th of Jan 2016. I don't mind paying more money each month as I just want a more consistent speed. Weighing up the pro's and con's of each against the chances of the speeds dropping through the floor again with VirginMedia. I've been lucky to never see any slow downs on Virgin in Londonderry or Belfast, but when it does happen it does pretty much cripple the connection. It really depends on what you use it for? I know gaming etc is impossible, for myself as long as I can stream I'd be happy enough. Was there a fault open for a utilization issue and has it been marked as resolved? two days is nothing, keep ahead with the migration you wont regret it. That's what I keep telling myself as I don't want to be stuck with VM for another 12 months if it plummets in speed again and as I type this still getting 100 down 5 up but for how long? 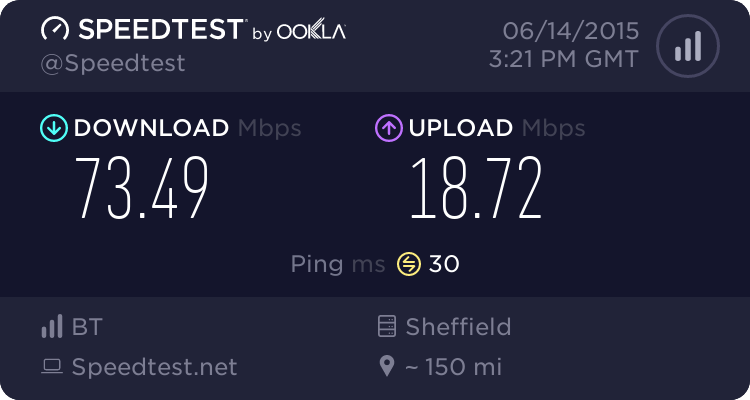 Well now officially virginless and so far so good with pulse8 getting the same speeds up and down 24/7 so far so a lot better than virginmedia. Not really when you compare it to BT who charge £48 a month for the top FTTC package. Expensive compared to who? Worked out cheaper than Sky Fibre Pro for me. It is also a monthly rolling contract for line and broadband compared to most other providers who have a minimum of 12 months.